Obviously, some changes need to be made. Nasty now comes from Manehattan. The main question is what sort of pony is she? Earth Pony covers her physical aspects, but Unicorn would provide her with her powers. Decisions, decisions. Other than that, the rest of the creation process works out the same. Either Unicorn for the superpower version of Nasty or Earth Pony for the pre-accident version. I'll work on both ideas in the one post. Like all starting ponies, Nasty starts at level 1. This is a tough one. Nasty definitely doesn't fit Kindness; she's very not the sweetest and gentlest of ponies. Nasty is the opposite of Fluttershy, really. The best two are Loyalty and Generosity. With Loyalty, while Nasty isn't easy to befriend, she does stand beside the ones she has. On the other hoof, Generosity covers the ponies with the biggest hearts, and Nasty has gone out of her way to help others. Given that the colour of the Element of Generosity is purple, that seals the choice. Nasty is very physical. While she does struggle in class, she's not stupid. Her main feature in /Subject 13/ is her ability to hit people, which is covered by Body. 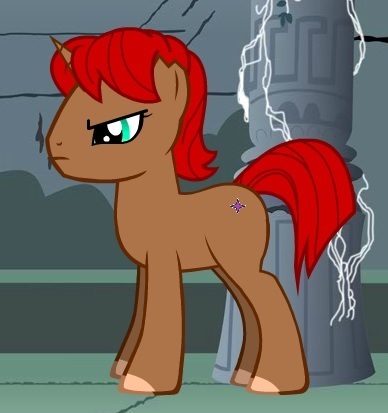 Pony Nasty thus becomes a brawny pony, both as a Unicorn and an Earth Pony. Her Mind is a d4, her body is a d6 as a Unicorn or d8 as an Earth Pony. Like every other starting Pony, Nasty's Charm is a d6. As a Unicorn, Nasty starts with 10 Stamina. As an Earth Pony, she'd have 12. The type of pony will influence the Talents Nasty will have. As a Unicorn, I want to emphasize Nasty's superpowers. Fortunately, there's a Talent in the book that fits here - Stun Ray. Unicorn Nasty also gets Telekenesis as a Talent. Earth Pony Nasty, though, will take Special Skill (Bucking); as a young filly in Manehattan, she got into a number of Scuffles. Earth Ponies also get Stout Heart as a Talent, which will allow Nasty to push herself once per session. Both pony types of Nasty get the Short Fuse Quirk, because she has one. I created the Unicorn version of Nasty. For the Earth Pony version, remove the horn. Nasty as an angry young filly. Created at Doll Divine. Somehow, she's keeping Nasty, even though it's not a great pony name. It's more a nickname, but she may need a better name. Nasty spends 50 bits to get a Hobby Kit, a set of tools. She saves the rest of her bits for later. And that is it for Nasty. Two ponies for the price of one! Both are playable and a good representation of Nasty without taking too many allowances, beyond turning her into a pony. Not bad for a simple system. Tails of Equestria is a robust system.